Welcome to Thisoldtrunk.com Q&A, if you leave questions, we will do our best to provide some information to assist you. Please check back for our comments about your question, but sometimes it may take a few days. I will not be able to provide estimates of a trunks value for you. Please email me at marvin@thisoldtrunk.com. for any question to be posted. Thanks! I get a lot of emails asking me if I will do a trunk appraisal. I have the information for this process listed on the Showcase page but some people do not see it there. So, if you are interested in a professional trunk appraisal please read the information provided at this link to item T105 on the Showcase page. Also, I am still answering email from visitors nearly every day. I have not been posting them on this forum page. So if you have questions about any of the items I have for sale, trunks or parts you are looking for, or specific information about your trunk, please contact my at Marvin@ThisOldTrunk.com If you are asking about your trunk please provide a few pictures including one that shows the whole trunk from the front. Moderator: Thanks Sarah, an excellent question which I really want to address! I have also noticed an epidemic of "salesman's sample" trunks, especially on ebay for the last year or so. It seems that everyone who finds a small trunk wants to immediately believe it must be a rare salesman's sample! OK, here is the truth about this which is documented by a lot of research by myself and another trunk collector and restorer. Based on information found in early trunk catalogs from several trunk manufacturers, they made a wide variety of small trunks and sold them as "Toy Trunks". They were made in very small sizes up to about 20 inches long. Some of them were quite plain and simple, with paper or canvas covering, and very little hardware or trim, while some were much more elaborate and made with very detailed interiors with several compartments, paper trim and lithographs, fancier hardware, brass locks with keys, leather or embossed metal covering, and other features. Those that were quite detailed and ornate as the large full size trunks were not cheap. Obviously the higher priced toy trunks were made for wealthier customers but there were many very inexpensive models as well. Newspaper ads from the late 1800's and into the 1930's showed "toy trunks" for sale by department stores, "5 and dime stores", and even furniture stores, especially in Christmas advertising. They were apparently popular toys for Christmas and I have even found a few that had writing on them that they were given as Christmas gifts. It's not hard to see why some people would think the fancier toy or doll trunks were salesman's samples because they are so detailed and some even have the label from the trunk company inside. However, I have found NO evidence that any of these Toy Trunks or Doll Trunks were used as salesman's samples. While there could possibly be a few small trunks that were made as samples, that was not the general way of selling trunks to new customers. Trunk salesmen would travel to show their trunk line but would not need a small sample or toy trunk to do that. 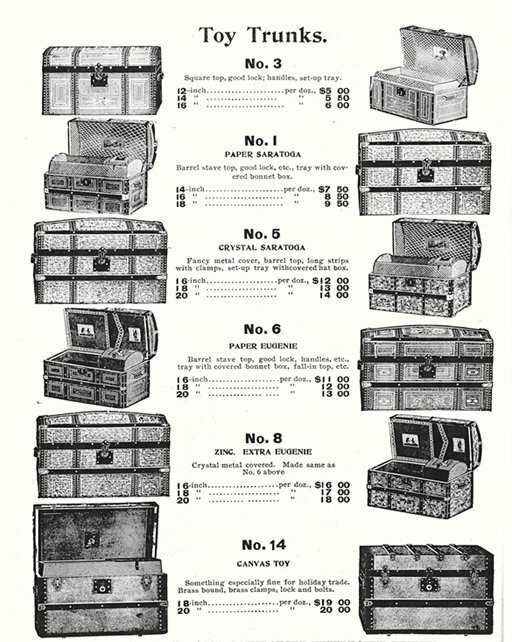 Trunk companies made a large variety of trunk styles and had detailed catalogs printed to show their models, sizes, and a price list. Some trunk companies even had their own retail stores, but many sold their trunks wholesale to trunk, luggage, and furniture stores. A salesman's sample would only be useful if it could show some special features or patented hardware from the trunk maker. The toy trunks that were very common and made by many companies would not show the customer any of the true features or special hardware of the full size trunks. Salesmen would travel with a regular trunk or bag which would carry their catalogs and possibly samples of their other special hardware or trunk coverings to show the customers, as well as the trunk or bag itself. (Remember nearly all trunk companies were "Trunk and Bag" companies.) Most trunk companies made large "Sample Trunks" which are shown in their catalogs and ads, and even listed on many trunk labels. These sample trunks were large heavy duty trunks made to withstand hard, frequent use by traveling salesmen of various companies. They were made in many sizes, normally flat top, and would carry everything from shoes, wallpaper, hardware, or whatever their companies produced. This was big business for trunk companies in the late 1800's to early 1900's as many new companies had salesmen traveling the country. So the "sample trunks" on trunk labels refers to the large heavy duty trunks, not a small salesman's sample. A true salesman's sample would be a scaled down replica of the actual product and would be useful for items such as a windmill, doctor's exam table with moving parts, a steam engine, or other large items. Patent models were also required by the U.S. Patent Office between the years of 1790 to 1880. These were made to show the specific feature, such as a trunk hinge, for which a patent application was being filed. These were NOT salesman's samples and were kept by the Patent Office and later some of these were sold off to private collections. Trunks were very common utilitarian items and the catalogs that were produced had enough pictures and detail for the customer to place an order for the trunks. So, if there ever was a miniature salesman's sample trunk it would have been made to show something really special from that company such as their patented hardware, not the common generic hardware used by many other companies. I have seen only a few small trunks that may possibly qualify as a trure salesman's sample, so they are extremely rare. This is really just common sense also. I believe that many people selling a small trunk, toy or doll trunk, want to say it's a salesman's sample because they believe it will increase the value. Many people have jumped on the band wagon to call their toy trunk a salesman's sample, when they know it is not. They want to put it in their ebay listing hoping that it will get more attention. I believe many do this intentionally and over time this is confusing many people and rewriting history. So, be careful when you consider buying something because it is advertised as a "salesman's sample", especially if it's a small trunk. Small trunks and toy trunks are still very collectible and valuable if they are in good condition, unusual, ornate, and detailed, but not because they were a salesman's sample. Please email if you have any other questions on this topic. Thanks. Question: Hello, I've enjoyed reading information on your website. I acquired a trunk which I believe is from the late 1870's and has some corner hardware with Pat. Oct. 23, 77 on it. Some of the pieces have some silver coloring remaining on them. Can you tell me if that is original or did someone paint them silver at some time? I see some folks on ebay selling similar trunks with hardware painted gold or brass. Can you tell me which is original on this type trunk? Thanks very much. Moderator-Answer: Jim, that's a great question and I've done a lot of research on that topic. First, the parts dated Oct. 1877 on your trunk were patented by Charles Taylor of Chicago, owner of Taylor Trunk Works. But that does not mean the trunk was made by Taylor Trunks. It probably was made by one of many trunk companies around the United States because many Taylor patented parts were sold to many other trunk manufacturers. The patent date will still be on the parts, but not the name Taylor. Taylor also patented other trunk parts, including a slat clamp on March 16, 1880, which is a very common part found on trunks made by many other trunk manufacturers from the 1880's until about 1915. Most of these parts were made by a large trunk parts company called Sessions Trunk Parts in Connecticut. According to a variety of old trunk catalogs and a trunk parts catalog I own from the 1880's, most of the hardware of the 1870's to 1890's was tinned, which gave it the silvery look. Tinning was basically coating or dipping the parts in tin. This was an inexpensive way to make the trunk parts look very impressive with "silver" parts such as some locks, slat clamps, braces, ornamentation, and even the tacks and nails. I've worked on hundreds of early trunks which had the tinned hardware and nails. Often when a part is removed you can see the original shiny tin finish on the back. But the tin finish wore off after several years of use and so most of the parts now look gray or dull in color. That's because of the cast metal that was used to make the trunk parts. Several catalogs listed trunks with tinned hardware and tinned nails. Brass plating of trunk parts did not start until the late 1890's and replaced the tinned parts on most trunks by around 1900. Some trunks prior to 1900 had solid brass hardware, but that was only used on the most expensive model trunks. Examples are listed in trunk catalogs of the 1880's and 1890's. So, it is not authentic and original to paint the hardware and nail heads brass on trunks from the 1870's to about 1900. People who do that just don't know any better and have been told that those trunks had brass plated parts. But, as you mentioned you can normally see traces of the tin on the old parts. Trunk styles went through a transition over time and so did the hardware used on them. This is one of the main ways to determine the actual age of a trunk. Thanks. Hello, my question is about restoration and painting hardware on trunks. I have seen several trunks where the owner says that the hardware (slat bumpers, catches, lock, etc.) were painted with gold or brass paint "to bring it back to the original" finish. I don't really like the way they look, but I guess some people do. Is this something that you recommend and do you think this is a proper way to "restore" the metal parts on a trunk? Would this help or hurt the value? Thanks. Moderator-Comment: Dear Joe, Most older trunks, prior to about 1900, did not have brass hardware or brass plated hardware, but some did, such as the brass pieces on Jenny Lind trunks and brass locks on many trunks. Many trunks made after about 1900 did have parts, such as the locks, bumpers, etc. that were brass plated, and most are now found in fairly worn condition. I have also seen trunks that have all the metal parts painted with gold or brass paint, and personally I don't like that look, especially if it is gold paint and the parts were not originally brass. But everyone has their own opinion on that and how to finish the metal parts. The options include leaving it "as is" if the condition is not very worn or rusty, which I prefer. But if the metal is rusty it should be cleaned and then protected with paint in my opinion. Some people buff the metal with a wire wheel and leave it the silver color, but that of course is not original either. So, since most trunk metal parts were either painted black or brass plated, I believe in returning them to the most original condition, such as by repainting when appropriate. You can look closely at the metal parts to see if they were originally painted, or if they were brass plated. You could remove brass plated parts and have them re-plated, but that can be rather expensive. So if you like the brass look, there are some pretty good paints now that look similar to real brass. Or you can use black paint if the parts were not plated, and I think a satin black finish looks more appropriate on old trunks. I believe that tasteful and original looking repainting does not hurt the value of trunks, but painting all the parts gold or brass when the trunk was not made that way certainly can. I also suggest not repainting the metal if it is in good clean original condition, even if the brass plating is somewhat worn. Generally restoration including repainting increases the value of a trunk if it is in poor condition, but it must be done carefully. Thanks. NEED INFO ON "TRUNK and BAGGAGE MAKERS INTERNATIONAL - AMERICA"
I came across an old trunk at a garage sale and FELL IN LOVE - allthough it's in pretty bad shape I had to have it! I'm looking for more information on it - what look like hammered sheets of metal (maybe copper? needs to be cleaned to know for sure) secured by wood trim adorn the exterior. There are also metal medallions (?) with scroll work as accents. Inside has the a-typical picture on the inside of the lid as well as a red triangular union (?) label mentioned above on the inside front wall. If anyone can help with more information or a resource web site, I would be very greatfull! Moderator-Comment: I'm sorry that I don't have any information on that particular trunk maker or company. There are many trunk makers that there is practically no information available on now. Maybe if another reader has some information they can email it to me and I will list it. Please email marvin@thisoldtrunk.com. if you have more information or other trunk questions. Thanks. Moderator-Comment: You might try checking the reproductions of early trunks at www.thetrunkshoppe.com. They reproduce trunks and document boxes from the 1700's and 1800's. If you email me a couple pictures I may be able to help you a little more. Any suggestions for refinishing metal parts on trunk? Moderator-Comment: Sure, there are a variety of things that can be done. Originally trunk metal parts (all that I have seen) were painted, so the authentic restoration would be cleaning and repainting the parts with the same colors. Some people prefer to strip paint off of metal parts and leaving it with the bare metal look, and that is fine if you prefer that look. Some people paint some of the metal trim with gold or brass paint and claim they are "bringing it back to the original", which is not true. I have seen this in many ads for trunks and it bothers me personally and looks "tacky" to me. Some early trunks did have some hardware such as catches and slat clamps that were nickel plated, and a few had brass plated or solid brass hardware, and those can be carefully polished, even if they aren't like new. Solid brass hardware, except for some locks and Jenny Lind "buttons", is quite rare actually. Some trunk trim parts are being reproduced, but not very many parts or styles. Some of these are brass plated and to me they look too new on old trunks, but they can also be painted or the finish rubbed some to take the brand new look off of them a little. Also, if the metal is in pretty good condition with minor wear and scratches, you can carefully clean it and leave it alone or coat it with a satin finish for protection. Not all trunks need repainting. The advice I would give is try to keep it as original as possible and don't change the colors from the original. Please ask if you have more specific questions. Thanks for the very interesting history on Star Lock Works and the differentiation between lock and trunk manufacturers. As with many of these ninteenth century trunks, mine has a lithograph of the period. I presume this was to date the trunk, however, this one has no inscriptions or autograph. How would I go about guaging the year of manufacture by the illustration glued to the inside lid? Moderator-Comment: Another interesting question about a topic that is misunderstood by many trunk owners! The color pictures or "prints" as some people call them, are chromolithographs. This process was developed in the 1870s and many printing companies started producing these and a few companies sold these in a wide variety to trunk makers. I have seen hundreds of different chromolithographs in trunks over the past 30+ years and few that were alike. Also, 99 percent of these that have been seen are not signed or dated in any way. These were put in the trunk lids, on compartment doors, and sometimes on the trunk's tray covers also. These were used from the 1870s to 1920s and there is no way that I know of to use these to date a trunk or to determine which company made the trunk. The best way to determine the age of a trunk is by the style of the trunk and the hardware and patent dates on any part of the trunk can help determine the approximate age of the trunk. Moderator-Comment: Star Lock Works in Philadelphia made a variety of nice brass trunk locks for trunk makers. They didn't actually make the trunks, but they made really nice trunk locks. They were founded in 1836 by Mr. Liebrich and originally the locks were marked with C. Liebrich, Phila. and then in 1869 he retired and two partners, Hillebrand and Wolf took over the company and called it Star Lock Works. They made trunk locks and stays, keys, padlocks, latches and springs. An early trade card advertising Star Lock Works was shown in the Bicentenial exhibit for Philadelphia in 1976. I think they finally went out of business in the very late 1800s. This is a good question because many people think that the name on the lock would be the trunk maker, when in fact this is rarely the case. There were several large lock companies that made most of the trunk locks, including Eagle, Star, Yale, and Corbin. Many of the locks do have a patent date on them and that can help estimate the age of the trunk, but won't tell you who made it. I found a old footlocker in my barn which is painted olive drab green and leads me to think it is an old military footlocker. It has a tag on the top lid which indicates that it was manufactured by the Belber Traveling Goods company. It has leather side handles. Any thoughts on its approximate age or someone I could contact at Belber. Moderator-Comment: I don't think Belber is still in business, but I do know they made desk trunks and footlockers for the military for many years. Your does sound like a military footlocker and could be from the WWI, WWII, or Korean War period. I think they went out of business in the 1950's or 60's but don't have actual years. I think they started out in Philadelphia and then later moved to Smyrna, Delaware. what a wonderful website with an opportunity to send my comments. We have a trunk mfg by Rogers & Madison Trunk Corp. It has that logo on top with the number 3 Genuine Ply. Its a desk type with compartments inside for mail, paperwork, small drawers. In fact, the original paperwork has been left there in restoration since 1890. my husbands grandpa left it to him. Everything he managed including ledgers, old war ration coupons, bank deposits, car titles, etc. are still in there. On the outside there is a bit of ageing, its maroon in color, all hinges in good shape. can you tell me more info what is it worth? Moderator-Comment: This company was in Petersburg, VA and probably made this trunk around the turn of the century up until about the 1920s. A few companies made desk type trunks and many were made on contract for the military, many around the WWI period. I had a nice one that sold a couple years ago, made by Belber Traveling Goods. These are interesting and fairly hard to find, but I can't give an estimate on a trunks value without seeing it or some good pictures, because condition, completeness, age, style, size, and even location can make a big difference in the value. But the value of having a family heirloom would probably be more important. i have sitting in my basement abandoned wardrobe trunk i was going to throw out but on further inspection i found a little metal plate its from r h Macy co. ny. it opens has draws hangers. has a bunch of steamship stickers from Norway on it. any info on this type of thing from the r h Macy co. would be appreciated. Moderator-Comment: Several of the large retailers including Macy's, Sears, Montgomery Ward's, and others, had a variety of trunks made for them by large trunk companies and put their name on them. They sold a variety of styles as evidenced by the old catalogs showing a wide range of trunks. Your wardrobe trunk, and those are mostly from around 1900 to the early 1930s, could have some value depending on the condition, style, completeness, etc. It would be worth checking with a local antique dealer to see what they think. I have an odd wardrobe trunk by National Vulcanized Fibre Co. It has a hanger system that is not intuitive. the 'closet' side is very shallow, and has a pair of arms that are extendable when it's open. The hangers are held inside a spring loaded sandwiched bar. pull the tab, it releases the hangers. There is also a swivel hook on the other end, maybe for hanging the bar in a closet. What's got me is how this setup is meant to hang a suit inside the closed case. the bar will not rest on the arms with the case shut, because with the bar parallel to the lid, the hangers will not clear the inside wall. There's not a center mount for the hangers or lock bar. If there was a hook for the bar, the length of the lowermost suit would be outside the case. Have you ever seen one of these and understand how they are intended to work? I would like to use this case to store a few of my suits. NVFCO has sure managed to make a fool of me. Moderator-Comment: I have seen a variety of wardrobe trunks and also many in trunk catalogs, but unfortunately I have never actually tried to use one, so really can't help you much there. You might try visiting the Hartmann trunk company website, one of the few trunk companies that made many of these type trunks that is still in business, and maybe there is some information that could help on their history page that has some pictures. Good luck. More information concerning the humpback trunk in prior inquiry. The side lock patent date is July 9, '72, The center lock patent date is March 1886 and September 1887 with a five pointed star. The harware on the lid at the junctions of the wood banding is marked Pat'd March 16. This occurs in six places, two of those are mirror image or stamped from the wrong side, I assume this indicates the patent marking stamping preceded the decorative forming pressing. There are four small iron wheels on inlet casters on the bottom of the trunk. The smooth metal coverings appear to be "japaned" black. The wooden banding looks like oak and has decorative lines inciced along the length they are about 2" wide. Moderator-Comment: Curtis, Your trunk actually fits the description of many embossed metal covered trunks from the 1870s to 1910s period and these were made by many companies. The patent dates do help with the approximate age, probably from the late 1880s to 1890s. The lock sounds like a lock from Star Lock Works in Philadelphia. The lock companies sold locks to trunk makers and didn't make the trunks. The metal pattern is a more unusual one but I have seen that a few times. There were about two dozen patterns used of the embossed metal and many color combinations have been found, including the ones that look like brass plating or "gilded". That is about all the information I am able to provide on your trunk. Thanks. I have a dome top trunk with an interesting lock-hasp it folds up from the bottom and has a patent date of September 1887. There are two side locks that open with levers on the side of the lock and are patented in July 1872. The sides and middle area of the top are covered with embossed metal in a floral pattern that looks like rasberry leaves and fruit, this was at one time guilded and that has faded to a gray green patina. Any information about this trunk would be appreciated. i have a wardrobe steamer style trunk it is in beautiful condition, i use it as a piece of furniture. it has all the original pieces except the iron. i have all the hangers, and the ironing board. Moderator-Comment: Donna, that's great that you have such a complete wardrobe trunk. Many companies made those from around 1890 to the 1920's. I'm afraid I don't have any information on Murphy's but you might try checking with the business bureau or historical society in St. Louis to see if they have any history on the company. Good luck. Hello, and my compliments on a Wonderful, informative website.. I have a Belbar Steamer Trunk from 1921. It is in beautiful condition, with all parts, hangers, etc. My Problem, is that it had sat in a moldy, damp basement for decades, and now smells terrible! I have used fabric cleaner, and scrubbed the whole thing down with a soft brush, and rinsed very well with a garden hose. I let it dry in direct Sunlight. This did help, but still smells. I bought Fabreeze Anti-Microbial odor remover, and doused it with that as well. No good. I then put it in a walk in closet with an Ionizer, and that has been for 3 days now. Took it out last night, and the mold smell is still there. I want to use this trunk as mu dresser......have you had any experience with the removal of mold odors in trunks? Thanks very much for your consideration, and thank you for having this website. Moderator-Comment: Brent, removing some odors from old trunks can be very difficult and you have tried options that will sometimes work. The odors get trapped in the fabric lining and even in the wood body of the trunk. If those options have not worked satisfactorily, then the only other option that may work is to remove the interior lining and then seal the wood with a couple coats of wood sanding sealer. Good luck. Just wondering if you can tell me where to look to find any information on a trunk. Any information you may have would be ideal. It's a black leather trunk. It is about 2 feet by 3 feet and the depth is about 2 feet. The metal tag has Rogers Brothers & Kevar along with Paramount Baggage, Petersburg Virginia. Moderator-Comment: Mary, there were many trunk companies in the US between the early 1800s to about 1920 that we know very little or nothing about because they went out of business leaving little or no information. I do know that Petersburg VA had one of the largest trunk companies ever, Seward Trunk & Bag Co. Also, there was a Rogers and Madision Trunk Corp in the early 1900s and this could have been the origin of the company you asked about. You might try contacting the business bureau or historical society of Petersburg to see if they have any records or information. I have found a P.C. Murphy Trunk Co. Wardrobe trunk that I may purchase. I am having a hard time finding much information about the company and what it is worth. It is a gold metal trunk with a gold (maybe silk) fabric lining. The flip lid is velvet lined. The right side has 3 small drawers (with a secret drawer in one) and 4 large drawers. The left side has a dust door. This has the only damage where it has rubbed on a hinge. It is solid with pleated fabric in the center. The hanger area has a thing you push back to hold cloths tight and 12 hangers of 3 different types. This seems to be a fancy trunk. Was it an upper end one when bought? When would this have been made? What would be it's value now? I don't have a good place for it now but will in a few years when my kids move out. I hate to pass it up if it is a good deal. Moderator-Comment: Hello, If you can email a few good digital pictures or mail photos and provide the dimensions, I can provide you an offer. Thanks. i was thinking of buying a trunk made by the bebber traveling goods company i was wondering how much i should offer. it really looks like a traveling closet with hangers and places to put your clothes. Moderator-Comment: What you are describing is a "wardrobe trunk". Belber Traveling Goods and many other trunk companies made these from the 1890's to about 1925. The value is based on condition, age, style, completeness, size, maker, and even location. Since these are usually quite large they can be more difficult to ship now or to use for other purposes (such as a coffee table) than the smaller trunks. In good original condition these sell in the range of about $200 to $500, maybe more for fancier models. A Louis Vuitton wardrobe trunk would typically sell for much more due to the famous name. I have been given 2 trunks made by Tronick & McKenzie. Could you please direct me as to where to find information about these trunks. They are metal with a shelf that lifts out and storage on the bottom. Thank you for the help. Moderator-Comment: Hello Deborah, You have a Wardrobe trunk probably made between 1890 to 1920 when these were very popular. Mendel made many of these in Cincinnati Ohio. They later became Mendel Drucker Trunk Co. Most wardrobe trunks are of this type arrangement of drawers and hangers. Some fancier ones have fold down desks, ironing boards, briefcases and other accessories. Copyright 1999-2005 This Old Trunk. All rights reserved.